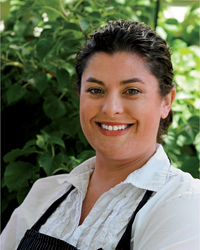 Up Next: A cookbook incorporating Erickson’s recipes with stories from her staff, and the farmers and oyster growers who supply her kitchens (scheduled for fall 2014 release from Sasquatch Books). All of the women cookbook writers of the 20th century, especially Elizabeth David and Julia Child. I didn’t go to culinary school, and bought my first restaurant when I was really young, so a lot of my learning was from books and reading. Their approach is clear—they’re specific about why they’re doing what they’re doing. The most important thing I learned from them is being honest and cooking from your heart. What was the first dish you ever cooked by yourself? It was probably a toss-up between chocolate chip cookies and boiling crab as a kid. I spent a lot of time on the beach in the Northwest. We’d boil pots of seawater on the beach and cook crab that way. What is the best dish for a neophyte cook to try? Roast chicken. It’s important to heavily salt it, and roast it in a hot oven: 450 degrees for the first 15-20 minutes, and then turn it down to 400. Use a meat thermometer, so you can be sure it cooks to an internal temperature of 160 degrees. Right now my favorites are any book from Nigel Slater. I love his simple daily recipes. I want to plunk myself down into the middle of his idyllic London world. It feels similar to Seattle in many ways, but it’s foreign as well. He also incorporates the Indian and African influences in England, which are quite decadent. What’s the most important skill you need to be a great cook? A willingness to work harder than you can ever imagine, and generosity. Cooking for people is about caring for them and making them feel restored. You have to be a giving person to do it well. Boning fish. I can bone a salmon, but there are so many weird little fish whose bone structures I don’t know as well. What is the best bang-for-the-buck ingredient, and how would you use it? Agostino Recca whole anchovies packed in salt. I use them in sauces, throw them straight into pastas, salads and vinaigrettes. You can put them in water and pull the salt out, and they fillet really easily. You can marinate them in olive oil or eat them on a cracker. Herring, for the past year or so, ever since a fisherman sold us 1,000 pounds of them at Walrus. We froze them and now use them sporadically. We’ve been smoking some to make smoked herring butter, one of my most favorite things in a long time. What restaurant are you dying to go to in the next year, and why? La Tupina, in Bordeaux. It’s a simple place. [Chef Jean-Pierre Xiradakis] cooks everything over wood coals. Best bang-for-the-buck food trip: Where would you go, and why? I’m going to be greedy and say Seattle. It’s not expensive to get here. We’re between the mountains and the ocean, so we have everything. The variety and quality are amazing. In Puget Sound we have all the oysters. In the mountains it’s all the foraged foods and greens and mushrooms. And in between is valley, with tons of produce. There’s a plethora of incredible ingredients less than an hour’s drive away. What is the most cherished souvenir you’ve brought back from a trip? A wood-handled Inox oyster knife. I got it three years ago in Paris. My art background helps in cooking. Outside work, I’m a pretty good gardener. I plant all sorts of weird herbs, raspberries and arugula. Not in any quantity, but it’s fun to bring into the restaurants. I also have chickens, so we use their eggs. A floating oyster barge in Puget Sound. If you were going to take Thomas Keller, Tony Bourdain or Mario Batali out to eat, where would it be? I would pick Tony because I’ve met him and he’s fun. I’d take him to Hog Island near Petaluma [California], and eat oysters and drink beer. If you were facing an emergency, and could take only one backpack of supplies, what would you bring, and what would you make? Anchovies, lemons, olive oil, a white Loire wine, Rainier Beer, smoked herring, Triscuits, Espelette, butter, Jacobsen salt, saucisson and Rockwell beans. I’d make smoked herring and butter on Triscuits. I’d serve the beans with anchovies, lemon, olive oil and Espelette, and eat the saucisson. I’m hoping they’ll be talking about herring. There’s lots of it. They’ll probably be talking about insects. Name two or three dishes that define who you are. Oysters on the half shell with rye bread and butter, served with lemon. Dungeness crab melt with tarragon mayonnaise and Beecher’s cheddar cheese, on an English muffin. I often eat a toasted English muffin with Adams crunchy peanut butter and Ballard Bee honey. My favorite snack is plain Lay’s potato chips. Best new store-bought ingredient or product, and why? I’m a big fan of a smoked Turkish chile called urfa biber. It has a bright, citrusy aroma and a toasted, smoked quality. It’s really rich. Do you have any food superstitions or pre- or post-shift rituals? Canned beer at the end of the shift.